The she was Heather Reisman of Chapters leading the campaign against Iran and the now cancelled and despicable stoning of an Iranian citizen. Big oped in the Globe. Ah and there was former Liberal Cabinet minister Irwin Cottler yesterday in Jerusalem with his The Responsibility to Prevent Coalition, in high dudgeon about Iranian nukes. Iran by the way has no nukes while Israel has a roomfull. Cotler’s wife, Ariela, is a native of Jerusalem who and worked as a legislative assistant to the Likud parliamentary members from 1967 to 1979.So Cottler is hardly an honest broker. One naturally should be appalled at the Iranian situation and I added my signature at avaz. But this is not the point. But Reisman —wow.The mind boggles. You’ll never find Jeff Halper’s books (An Israeli in Palestine)or Avraham Burg’s (The Holocust is Over) or Jimmy Carter’s (Peace, Not Apartheid) as one of Heather’s picks. No and it won’t be public knowledge that she and hubby Gerry Schwartz who control Chapters, support Israeli soldiers enforcing the illegal and brutal occupation of Palestine. The Israeli military has a well-documented history of human rights violations and war crimes in the West Bank, Gaza Strip, and Lebanon. Heather Reisman and Schwartz sre proud sponsors of “Heseg Foundation for Lone Soldiers”, which provides scholarships and other financial support to soldiers in the Israeli Military on the basis of need and military “achievement”. These Lone Soldiers are those iwithout family in Israel who have chosen to join the Israeli military and remain in the country permanently. 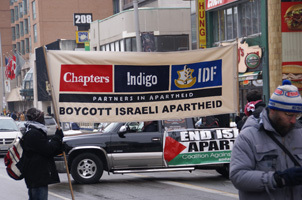 There is an international boycott of Chapter for this reason. So whenever you hear Irwin Cottler or Heather Reisman bleating about Iran—caveat emptor. 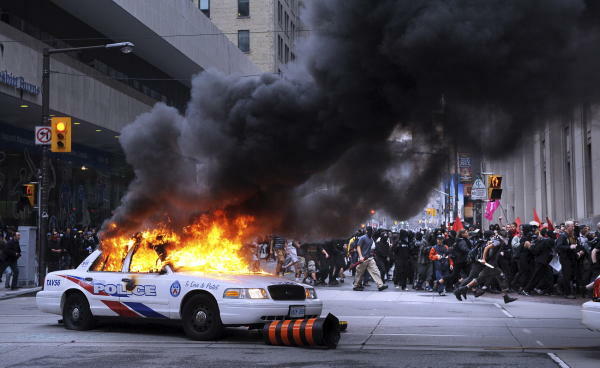 Officer Paul, our favourite ex-cop, laughed about the burning cop cars at the G-20. Just stage props, he said. Part of the drama. Officer Paul laughed and said the boys would have bee told to take all the valuables out of the car before you leave it to the few yahoos to trash. Like who would leave a police car unattended? “I would have had to pay for it if I was still on the job,? he chuckled. The media of course love this theatre. They put it on a loop , keep running it over and over and all the deadheads who have never marched, wrote or picketed for anything in their lives, and who live in the suburban mind were convinced Toronto was burning. Good for those cops for saving our bacon! All it would have taken was 100 cops ( out of 14,000) on Yonge Street to stop the pillaging. All those who don’t care enough about the massive gap between rich and poor , who don’t get that working people globally are paying for Wall Street’s greed wade in with their uninformed commentary. All devoid of serious analysis. Now folks are waking up to the fact that this was Steve Harper’s gift to Toronto where he has no votes. Let them deal with it was his attitude, knowing full well what had happened in every other urban setting which hosted this debacle. A billion bucks wasted. Democracy diminished and fear and cynicism stoked. This just in. And just in time for the 4th of July. Helen Thomas and so many others were right…and so many Americans shot themselves in the head and made the rest of the world roll their eyes in wonderment. Bush Jr., incurious George was by far the worst. And Ronald Reagan, the king of the deficits was not much farther behind. That’s in my poll. And Jimmy Carter’s as well. Some Americans still want him on Mount Rushmore. Go figure. George W really was the worst modern president, say 238 presidential scholars. 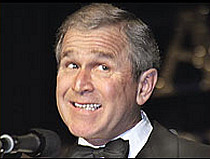 The Siena Research Institute says Bush was the worst president since Warren Harding in 1923, and one of the fifth worst ever based on factors like intelligence, communication, foreign policy and economic matters.